Had the mainstream media acted responsibly, then every word spoken at the first major post-Climategate climate colloquium would have indeed built public awareness of the implausibility of manmade global warming and, consequently, any job-killing legislation, treaties or regulations designed to “control” it. But ours is an agenda-driven MSM – brazenly toting water for a president and Hill Democrats shamelessly rolling out the Gulf-coast disaster crash-cart to reanimate their flat-lined “climate” bill. Mine is the task of summarizing – to the best of my ability — the current state of climate reality, as espoused before me one month ago by no less than the greatest minds analyzing the subject today. And yours is the opportunity to quickly absorb the collective wisdom of over 75 experts speaking at 5 plenary and 20 breakout sessions, and countless marvelous conversations, all spread over 3 days. And to discover or affirm the myriad inconvenient truths behind the “global warming” hype. Let’s begin with arguably the most significant but unquestionably the most conference-ubiquitous. For years now, alarmists have arrogantly ignored the cooling we’ve experienced worldwide since 1999, continuing their demands that we sacrifice everything – jobs, money, comfort, progress and ultimately, freedom — to halt fictitious “runaway global warming.” Such unfounded hysteria seems all the more inane after hearing the unvarnished truth from the experts at ICCC-4, beginning with their predictions that the global cooling will likely continue for the next few decades. Fig. 1 – From Don Easterbrook. Since 1900, global temperatures have closely correlated with the PDO Index. This belies AGW and portends a coming big chill. Hurricane specialist William Gray also brought along some mighty convincing charts proving that most of the warming experienced in the past thousand years can be attributed to deep ocean circulations, strengthened and weakened by century-scale salinity variations. While the relationship of Sea Surface Temperatures to evaporation, rainfall and wind patterns, albedo and, ultimately, air temperature is complex and beyond the scope of this article, suffice it to say that this translates to ocean – not carbon — driven global temperatures. Gray believes the Medieval Warm Period (MWP) was a result of a multi-century slowdown of the Meridional Overturning Circulation (MOC), similar to that experienced in the 20th century and corresponded to similar warming. Conversely, the Little Ice Age (LIA) was a period of stronger than average MOC, as we are beginning to see today. Gray, too, predicts that strengthening ocean currents portend global cooling over the next few decades, even as carbon dioxide levels continue to climb. So how is it that the National Oceanic and Atmospheric Administration’s (NOAA) National Climatic Data Center just declared this year’s January-May period the warmest on record? AT readers are no doubt well aware that, thanks in large part to the efforts of WUWT’s indefatigable Anthony Watts, we’ve known for years that over 90% of American stations misreport temperature data by between 1ºC and 5ºC. Furthermore, “smoothing” adjustments to “homogenize” station data to that of surrounding stations and dismissal of the biasing phenomenon known as the Urban Heat Island Effect have grossly exaggerated 20th-century warming. Not coincidentally, Dr. Craig Loehle concluded that after subtracting UHIE and other measurement artifacts, a 59 year natural cycle of warming and cooling remains. And while that cycle matches that of the PDO to a tee, the MSM respond as though only “deniers” could possibly suggest a link. But last November we learned just how far ideologues at England’s Climate Research Unit were willing to go when glaring evidence that its scientists had doctored climate data to remove previous warm periods from the history books while exaggerating modern warming and suppressing modern cooling surfaced. And further investigation uncovered by a team lead by ICCC-4 presenter Joe D’Aleo revealed that the two primary U.S. sources of global temperature have also been manipulating land-based instrumental readings. NOAA has been strategically deleting cherry-picked, cooler-reporting weather observation stations from the temperature data and NASA has intentionally replaced the dropped NOAA readings with those of stations located in much warmer locales. Fig 2. From ICECAP’S Joe D’Aleo. 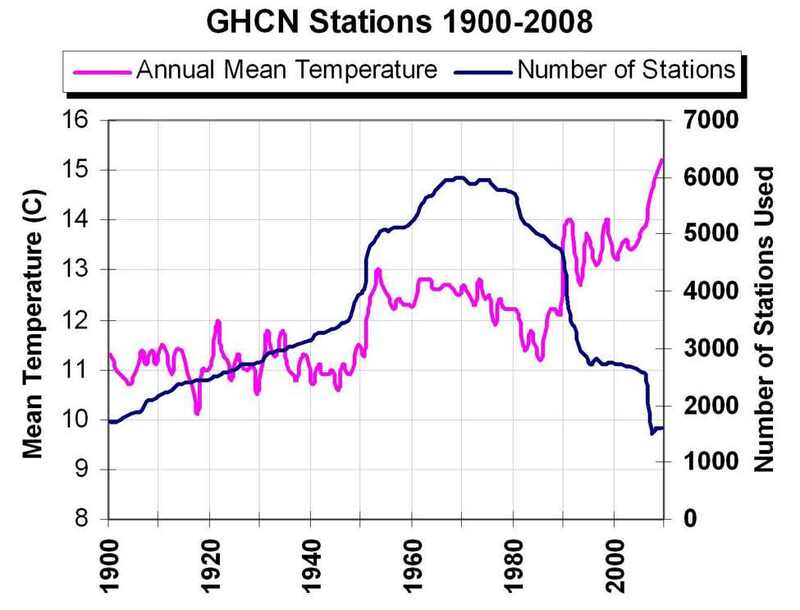 As NOAA’s Global Historical Climatology Network selectively dropped its US Station count from 5000 in 1990 to 1500 in 2007, reported temperatures rose inversely. Nothing to see here. This section’s heading is a quote from Ronald Coase, fittingly cited by D’Aleo during his presentation. For more details on why Joe concludes that “the surface data and models should not have been used for decision making by the EPA or the congress,” and that any proclamations of “warmest months,” “warmest years,” or “warmest” anything are utterly meaningless, see my January report here. Of course, the instrumental data manipulated by the US agencies is accepted as gospel by climate agencies worldwide. Climate Depot’sMarc Morano sided with the astronaut. Not Use Term Fraud? Hell No! It is so nice to have the light of day and stench of corruption coming from people like Michael Mann and Pachauri and Phil Jones and the upper echelon of U.N. scientists. We should be rejoicing that their entire careers are getting pissed on at the moment and justifiably so. That line drew enormous laughter. But there’s nothing comical about the malfeasance of the U.N.’s climate panel, its complicit agencies both here and abroad, or the efforts afoot to whitewash their conspiracy to defraud. As Easterbrook noted, computer models are the only basis for claiming CO2 is causing global warming. 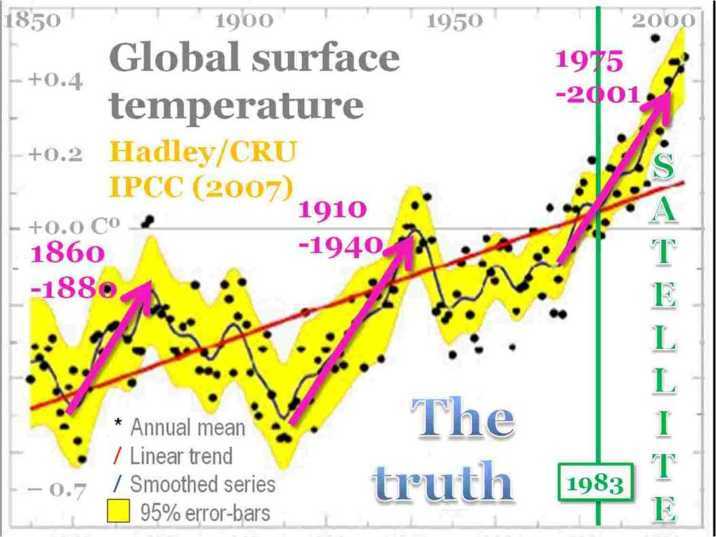 But IPCC models predicted 1ºF warming from 2000 to 2010, yet there’s been no warming beyond the 1998 level. So the models have been proven wrong. And ICCC-4 was teeming with scientists uniquely qualified to explain the errors of the modelers’ ways. As you probably know, IPCC modelers have declared probable climate sensitivity (the amount of warming to be expected by a doubling of atmospheric CO2, a likelihood this century) to be 3ºC. But they attribute 2/3 of that figure to positive feedback from clouds. William Gray explained why he believes clouds actually provide 0.5ºC of negative feedback for a total climate sensitivity of 0.5ºC. Indeed, the designation of clouds as negative rather than positive feedback has been a lesson taught by Dr. Roy Spencer and MIT’s Dr. Richard Lindzen for years. As Spencer explained, were warming due only to CO2, it would be a non-issue. The IPCC modelers derive their “catastrophic” warming predictions from algorithms whereby CO2-caused warming causes a decrease in clouds, which lets in more sunlight and leads to more warming. In truth, says Spencer, quite the opposite is true — weak warming increases clouds, letting in less sunlight and leading to less warming. In fact, Spencer believes that a full 75-80% of warming could be due to cloudiness changes due to PDO. In other words, most of past warming is likely natural and climate sensitivity is likely closer to 0.5ºC. We see that all the models are characterized by positive feedback factors (associated with amplifying the effect of changes in CO2), while the satellite data implies that the feedback should be negative. Only with positive feedbacks from water vapor and clouds does one get the large warmings that are associated with alarm. What the satellite data seems to show is that these positive feedbacks are model artifacts. In a uniquely fascinating lecture, frequent WUWT contributor Willis Eschenbach outlined his hypothesis that temperatures are kept within a narrow and fixed range by a governing mechanism of clouds and thunderstorms set by the physics of the wind, the waves and the ocean – but not CO2 forcing. And past IPCC expert reviewer Tom V. Segalstad also insisted that clouds are the real thermostat, with far more temperature regulating power than CO2. Fig 3. From SPPI. For almost nine years, the trend in global temperatures has been falling. 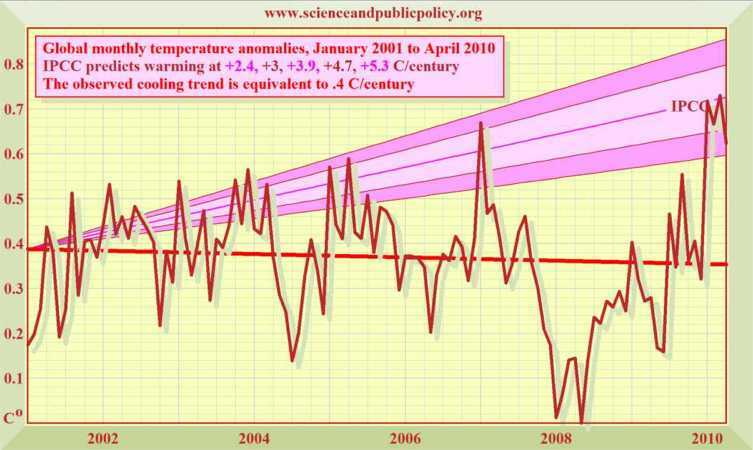 The IPCC’s predicted equilibrium warming path (pink region) bears no relation to the global cooling that has been observed in the 21st century to date. Note the very sharp peak in global temperature in early 2010, caused by a strong El Niño Southern Oscillation. Source: SPPI global temperature index. Geologist Ian Plimer exposed yet another problem with IPCC models — they completely ignore the role of volcanoes in their analysis. Both terrestrial, which expel heat, water vapor and CO2, and submarine, which add heat and gases to the oceans and also increase its CO2, play no part whatsoever in IPCC predictions. Physicist David Douglass revealed his comparisons of actual tropical temperature trends with 22 Model Predictions from 1958-2004. The models did not fare well — only 2 of the 22 matched observations. He also cited his Geophysical Research Letters-published collaboration with Pearson and Singer in 2004 which challenged the a hot spot 7-8km over the tropics IPCC models predicted would develop between 1979-2004. If the Christy et al. (2000) analysis is closer to the “true” tropospheric temperature change over the satellite era, then we do not understand the factors that influence observed lapse rate variability on multi-decadal timescales, and climate models cannot reproduce the “observed” differential warming. Models cannot be tested by comparing models with models. Attribution cannot be based on the ability or lack thereof of faulty models to simulate a small portion of the record. Models are simply not basic physics. Any wonder why J. Scott Armstrong found that of 89 relevant forecasting principles, the IPCC authors violated no less than 72 of them? Armstrong also noted that when Svante Arrhenius first proposed the “CO2 causes warming” theory in the early-1900s, the Swedish Nobel Prize winner expected the effects to be beneficial. And many agree. A century later in a Chicago hotel conference room, H. Leighton Steward inventoried many of the benefits of increased CO2, including a general greening of the planet, an enhanced capacity of ecosystems and habitats and an increase in productivity per farm acre. This in turn will help prevent conversion of pristine land to farm land and thereby lead to more food for an expanding population. Robert Ferguson of SPPI also examined the alarmist-ignored physiological benefits rising atmospheric CO2 and unrelated higher temperatures afford plant-life, and that it “is essential for meeting future food needs and conserving land for nature.” But rather than being marked for distinction, as claimed by alarmists, animal life will actually thrive in warmer, CO2 enriched environments, through enhanced species proliferation and diversity. During his lecture on solar activity, astrophysicist Willie Soon touched upon the impact of rising CO2 in the oceans and displayed the results of a study by Dr. Justin Ries of the University of North Carolina-Chapel Hill. It seems that increasing the CO2 in the habitats of the shellfish studied increased their growth sevenfold! And yet, last year the EPA classified the essential trace gas as a pollutant in its incongruous endangerment finding. Fig 4. From H. Leighton Steward. In a reversal of alarmist hype, Antarctica Ice Core Analysis depicts CO2 levels rising in response to warmer temperatures. Steward offered one of many reminders I heard that climate history indicates CO2 is a lagging indicator in climate change. In fact, an Antarctica Ice Core Analysis chart clearly showed the several hundred year lag of CO2’s response to prior temperature change. 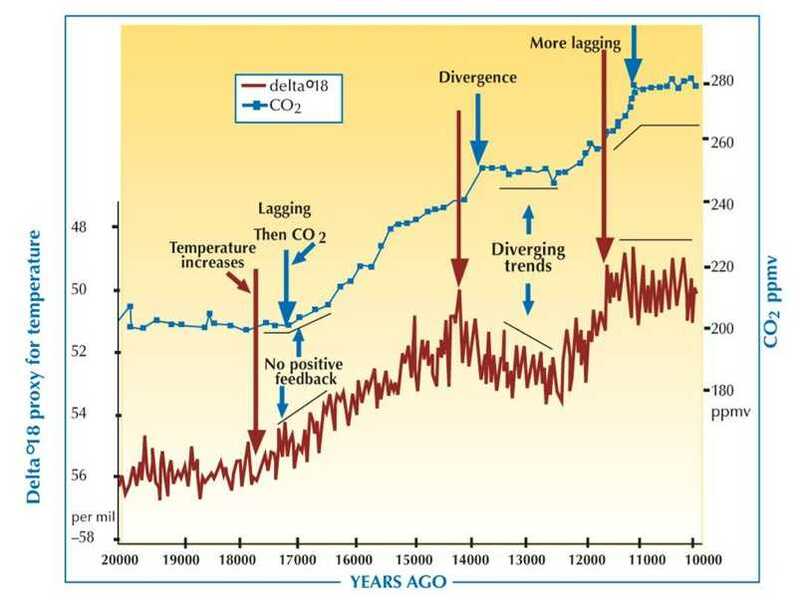 Ian Plimer showed that we’ve had up to 30% CO2 in oceans in the past with no acidification due to the buffering power of rocks, adding that the evidence is written in stone. 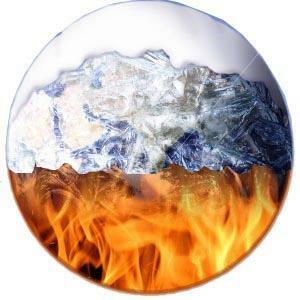 One of the most infamous post-climategate IPCC scandals was branded “Glaciergate.” The term refers to an AR4 warning that unchecked climate change will melt most of the Himalayan glaciers by 2035, which was found to be lifted from an erroneous World Wildlife Fund (WWF) report and misrepresented as peer-reviewed science. IPCC Chairman Rajendra Pachauri attempted to parry this “mistake” by accusing the accusers at the Indian environment ministry of “arrogance” and practicing “voodoo science” in issuing a report [PDF] disputing the IPCC. But one in his own ranks, Dr Murari Lal, the coordinating lead author of the chapter making the claim, later admitted he knew all along that it “did not rest on peer-reviewed scientific research.” As, apparently, had Pachauri (whom Monckton later referred to as “Casey Jones,” in recognition of his field of expertise — railroad engineering), who continued to lie about it for months so as not to sully the exalted AR4 immediately prior to Copenhagen. Madhav Khandekar cited Glaciergate as “a clear example how IPCC’s lack of oversight and ineptness can lead to an alarmist science with NO merit.” Khandekar notes that in reality, Himalayan glaciers aren’t melting any faster than glaciers elsewhere, and the two major Himalayan glaciers, Gangotri and Siachen, appear quite stable at present. And he presented facts which suggest that, contrary to ubiquitous visuals of pacific islands and coastal cities under meters of water, glacier melt worldwide may contribute about 105 mm to sea level rise (SLR) over next 110 years. Add thermal expansion from even 1ºC over the next 100 years (remember — Lindzen, Spencer et al suggest 0.5C and others suggest continued cooling) for an additional 100 mm and we’re talking in the neighborhood of 22 cm over the next 100 years. Even assuming that this statistic can be estimated accurately, it has little practical policy value. Local relative sea-level (LRSL) change is all that counts for purposes of coastal planning, and this is highly variable worldwide, depending upon the differing rates at which particular coasts are undergoing tectonic uplift or subsidence. And it’s exactly these LRSLs the always engaging Dr. Carter addressed in his presentation. Carter displayed a chart of eustatic SLR since the Last Glacial Maximum, showing the total rise since 18,000 years BP (before present) to be about 120 meters. The curve is quite steep as continental ice sheets melted (10,000 years BP the rate of rise was 2 m/century) and levels off to a nearly constant rate of rise in the past several millennia. Ian Plimer added that materials found from retreating ice show that we’ve had SL changes of at least 1.5km in the past. Message to warmists: As with climate, SLR rates are in continual flux and are never cause for alarm, but rather adaptation. But these global averages comprised many extreme local variations. Using his native Australia as an example, Bob showed many examples of areas where sea level was once (5000 ybp) many meters higher than it is today. Moving to Scandinavia, strandline deposits of mollusk shells signify that the shoreline was over 30 meters lower 5000 ypb due to icecap uplift. Of course, others conveniently exploit their local topography. Fig. 5. From Nils-Axel Mörner. Maldavian cabinet underwater photo-op was all wet. 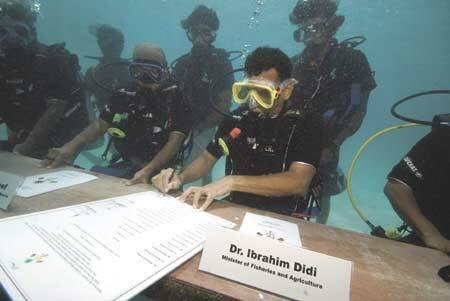 Perhaps the most famous hysterical response to SLR was this recent photo of the Maldivian president and ministers donning SCUBA gear to hold the world’s first underwater cabinet meeting as a “symbolic cry for help over rising sea levels that threaten the tropical archipelago’s existence.” A stirring visual indeed – but pure baloney says paleogeophysicist Dr. Nils-Axel Mörner, who reported the results of his highly detailed sea-level study of the area. It turns out that not only has SL been stable there over the past 30 years, but current levels are significantly lower than they were in the 17th century. Similar results were found in other IPCC “warning” areas like Bangladesh, Venice, and NW Europe – no significant SLR in as many as 50 years. What Mörner did find in all of these areas was a tendency for the IPCC to misrepresent coastal erosion as SLR. The tiger has lost its teeth. Julian Morris foresees corollaries of a direr nature, fearing that greenie concerns over technology could affect the very thing they’re most concerned about – widespread starvation. But not for the reasons the greens advertise. The U.N. is seeking what amounts to a wealthy-nations tax, asking developed countries to pony up 2% of their GDP for a U.N.-policed fund purported to help “developing” nations mitigate and adapt to climate change. The rationale? Developed nations owe a “climate debt” to the less fortunate “victims” of their greed. Of course, having come this far in this admittedly lengthy essay, you already know that progress has had no bearing on climate change, so spending billions to reduce CO2 emissions will reduce neither those emissions nor global temperatures. And that the ravages of climate change (SLR, hurricanes, etc) are hysterical hogwash. For a detailed explanation of how climate change is the problem to the U.N.’s solution of international wealth redistribution, see my expose — IPCC: International Pack of Climate Crooks. The problems driving Morris’ concern all stem from the unintended consequences of green “scare stories,” and he offered Rachel Carson’s bogus indictment of DDT in Silent Spring, responsible for the death of millions from malaria, as an example. The previous day, Indur Goklany had warned of a brewing crisis when he discussed his study that found death and disease from biofuel production more likely to be real than those estimated due to GW. As we learned from Soon, Steward, Singer, Schmitt, Ferguson, Idso and Segalstad (to name a few), a warmer, carbon richer world would in fact be a better world. Carbon is not a threat to any nation, developed or otherwise. On the other hand — malnutrition, diarrhea, AIDS, tuberculosis, malaria and lack of access to fresh water are real threats to third-world nations and it’s the very technology the warmists seek to impede that’s best suited to cure these diseases and bring these people out of poverty. Concludes Morris – by imposing “climate control” remedies in the third-world, more people actually will therefore die from “climate related” problems. This is patently preposterous and betrays an egregious lack of executive grasp. Any guesses why he neglected to suggest we “think of what’s happening in countries like Spain and Japan, where they are making real investments in renewable energy,” as he did in January of last year? Dr. Gabriel Calzada returned to ICCC to explain that as bad as Spain’s “green economy” was when last we met in Washington, it’s actually decayed further since. The Spanish economist revealed that last year’s devastating 18 percent “green unemployment” had now exceeded an astounding 20 percent. That’s because the country spent 28.6 Billion Euros to create 50,200 green jobs (that’s over 570,000 euros per green job) and – get this – for every green job created 2.2 jobs were lost. And the majority of these “green” jobs are temporary in nature, further decimating the Spanish workforce as they sunset. And while the government continues to pump more money into inadequate power sources, energy prices skyrocket, driving industry to cheaper ground, and the job market to even lower levels. In 2009, Spain’s public aid to renewables cost more than the whole national electricity production as the unitary cost of renewable energies reached 3 times the cost of other energies. That rate deficit reached 4.6 Billion Euros, which forced public aid to renewables to reach 6 Billion Euros. And then there’s the matter of cap-and-tax itself, a subject of much chatter at ICCC-4. Hans Labohm laid out the real numbers behind Obama’s ludicrous goal of “slashing US carbon dioxide emissions to 80% below 1990 levels by 2050.” Aided by the calculations of American economist Paul Driessen, the Dutch economist estimated that such a reduction would return the US to emission levels last seen in 1905 (a similar study [PDF] by the American Enterprise Institute puts the emissions number at a billion metric tons, last seen in 1910). But America’s 1905 population was 84 million, as compared to 308 million today, so per-capita emissions would need to be reduced to the levels of the horse-and-buggy days of 1862. And in a futile attempt to achieve that insane goal, we’d need to endure additional layers of environmental regulation, higher energy prices (for business and consumers), loss of international competiveness, regular blackouts, walk out of (energy-intensive) industries to countries with less burdensome regulation, waves of lay-offs, energy poverty, and an overall decline of living standards. Of course, AT readers know damned well such suffering would be for naught. In other words – All pain, no gain. What a year it has been. We are the consensus now. So began Lord Christopher Monckton’s conference-ender. Monckton’s masterful closing remarks have become an ICCC tradition, in which he movingly congeals the many truths learned in the prior sessions. Once again, he did not disappoint. Fig 6. From Christopher Monckton. Three post-LIA rapid-warming periods betray warming’s natural drivers. It, too, corresponds with the PDO (Earth to GHG crazies – anything?). But Monckton found more. It’s a 2005 paper by Pinker et al. depicting a satellite-detected global brightening (an increase in the flux of solar radiation reaching the Earth’s surface) from 1983-2001 due to a decrease in clouds. What’s truly remarkable is that the brightening for that 18 year period (2.9 Watts per square meter) represented nearly twice the IPCC’s estimate of the total anthropogenic influence on the climate in the 256 years between 1750 and 2005 (1.6 Watts per square meter). Please read and consider the previous sentence until you hear an “aha” somewhere in your vicinity before proceeding. Monckton was the final of many at this year’s conference to display Willie Soon’s 2009 graph of temperature v. solar irradiation (1880-2009) in China which appears to remove any doubt remaining of correlation. Fig 7. From Willie Soon. 130 years of Solar Irradiance (red) and mean surface temperature (blue). Alarmists: No link here. To recap – the U.N.’s top-dollar experts are presented with the occurrence of three all-but-identical rapid warming bursts since the end of the LIA. The first 2 are obviously naturally occurring as they align perfectly with PDO and solar irradiance, but not with ACO2. 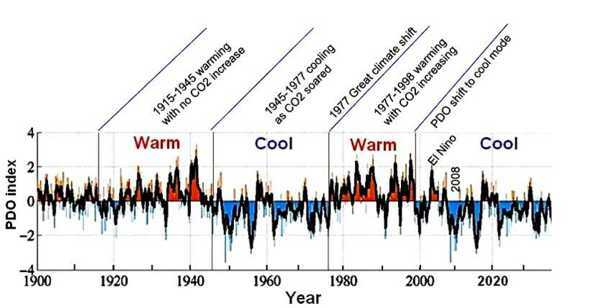 The third DOES correspond to rising ACO2, but also to PDO and solar activity. So to what does the IPCC attribute the third burst? Constructed a climate history that suppressed the MWP or the LIA, a major argument of CO2 advocates. 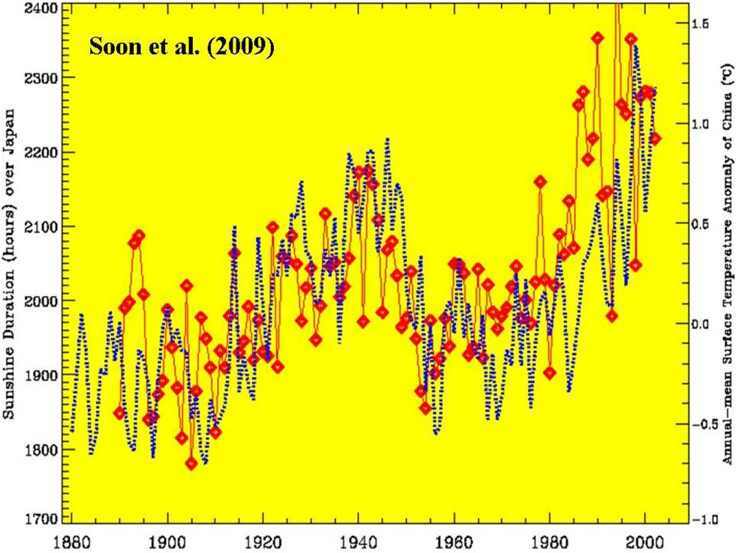 Doctored climate data to show increase global warming and suppress global cooling. Hid or deleted data that didn’t support their beliefs. Took over journal editorial boards to suppress opposing views. Alarmists also got caught grossly exaggerating the effects of climate change. Contrary to the 20 feet once predicted by Al Gore, SLR is likely to remain at the same 18-22 cm per century average rate it’s been for eons and vary from location to location. Claims of impending marine species extinctions due to increases in the atmosphere’s CO2 concentration are utter nonsense, as are those of disappearing polar and glacial ice. As for the latest craze – killer storms — global hurricane activity is actually at a 30 year low and violent tornadoes have been trending downward for even longer than that. Fossil Fuels (Coal, Natural Gas and Petroleum) provide 84% of the Nation’s energy, “Green” energy sources (Biomass, Geothermal, Wind, Solar, and Hydroelectric) account for just over 7% and nuclear almost 9%. There is no magic path to “Green jobs” or a “Green economy.” The ongoing disintegration of the EU should be proof enough of that. Sounds like game, set and match to me. And yet, left-leaning policy makers throughout the world would have us surrender all that mankind has achieved, “flinging us back to the Stone Age, but without even the right to light fires in our caves” as Monckton describes it. That even a small percentage of the population is willing to do so despite the overwhelming evidence that we are being conned by a well-organized and well-funded eco-socialist movement is nothing short of staggering. That Obama and the Democrats plan to exploit public outrage over the entirely unrelated BP disaster to muster votes for this larceny of our freedom is downright vulgar. Says Monckton: “At a time of grave economic hardship it is the height not only of folly but of cruelty to spend any more money whatsoever on trying to mitigate global bloody warming.” This was a rare moment of understatement from his Lordship. Given the new consensus — any time would be the wrong time to spend any money mitigating global warming. And the truth has become glaringly obvious.